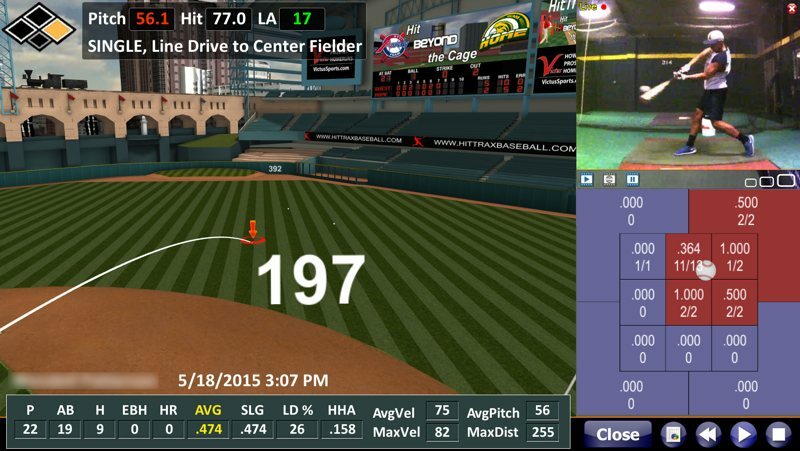 The HitTrax Video Capture and Analysis Module (VCAM) is the latest and greatest in hitting analytics. HitTrax won the 2016 ABCA Best of Show award and is currently used by collegiate and professional baseball and softball programs across the country. With HitTrax, players receive real-time metrics and are able to watch the flight of each batted ball inside all 30 MLB stadiums. Players can also compete in entertainment mode, either face-to-face or remotely, with quality hit games, home run derbies and more. The HitTrax database will store each player's profile and swings so that progress can be easily monitored and allows for the ability to easily identify player's strengths and weaknesses. HitTrax brings the on-field experience inside the batting cage allowing players to receive visual and statistical feedback with each swing as they improve and continue to make adjustments. Private hitting lessons at RBI can be done with HitTrax to provide video footage and swing analytics throughout the lesson. Each swing's exit velocity, launch angle, point of impact, distance and other key metrics are displayed and available for review to help players focus on strengths and weaknesses. Reports are also available and can be emailed to players at the conclusion of each session. The HitTrax Monthly Membership is available to any RBI Member as an optional add-on benefit. Players can use HitTrax while working out on their own, with a parent, friend or teammate, getting real-time feedback on each swing. In the Player Login mode, each session will be stored and available for review and comparison. Players are also encouraged to have fun in the Entertainment mode, trying the Home Run Derby, Demo Game, and Boost functionality. If you're an RBI HitTrax Member, feel free to bring a non-member friend to experience and hit with you on HitTrax. It will only cost your friend $10 for a day pass to hit with you. Teams and their coaches are able to rent the HitTrax cage and system for a small group or their entire team for 60-minutes. This rental can be used in a variety of ways - to analyze each player's swings, to compete in the entertainment mode with split-team games, individual home run derbies, the quality hit game, and more team-building exercises.